TOPTOTS was started at the end of 1994, in response to a need felt for parents to be able to meet other parents, and learn how to have quality interaction with their children. - Clean Up - This encourages children to become responsible for cleaning up their own toys. - Greeting Song - This greeting signals the start of the actual group. - Stimulation Activities - Individual boxes are packed for each age group. - Parachute - This is specifically a sensory exercise and will benefit all the TOPTOTS. - Creative - Art is child centred and can be messy. - Textures - We offer a variety of tactile experiences for all age groups. 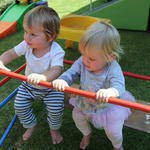 - Gross motor - A varied programme that stimulates large muscle development and motor planning. - Tea -Social interaction for mom. - Music Time - Chaotic expression. Action and instrumental songs with quality instrument. - Pilates For Baby- Ball activities are excellent for working on balance, joint compression, weight bearing, gravitational security and stimulation of the vestibular system, awareness of body in space and body position, and development of the large muscles. - Action Songs - TOPTOTS are encouraged to do actions to music. Repetition is key. TOPTOTS I Love you- cuddle song for mom, to say thank you for the time spent playing and learning. - Goodbye Time- Our own special Toptots goodbye. This signals the end of the group. Each TOPTOT receives a sticker at the end of group. Wow. There is not enough that I can say about Koren and her Toptots group. I had the pleasure of attending with my 4 month old for a year, and the input, ideas and support that Koren gave us was invaluable. I would recommend Koren to moms and dads looking for interaction for their little ones as well as themselves. Nothing quite like knowing you are not out there alone! Thank you Koren for walking with us through the first year! For a fun-filled educational experience for your baby/toddler, Toptots Bryanston/Randburg is the perfect place. Every class is an hour long and is tailor made for children of a similar age, incorporating art, fine motor, gross motor, reading, music and dance. All items needed are provided and the qualified owner, Koren Hayman, runs the class and gives guidelines to parents as to how to do each fun-filled activity in class and at home later. Parents and children are both educated hands on simultaneously. There is a very interactive play area that children can explore to their heart’s content before or after class. I highly recommend this establishment for all parents with babies and toddlers.